Marti Barletta knows how to sell to women. And she lets you in on the best ways not only to find affluent women customers, but also how to sell to them once you have found them. Selling to Affluent Women: Face to Face With Today’s Big Spenders is a quick read and a concise roadmap to prospecting, selling, and keeping women as your loyal customers. Marti is an expert on the differences in the ways men and women view the world and how that affects the way they make purchase decisions. • Introduce yourself and follow through with relationship-building activities. • Discover what she’s looking for in a product and persuade her to consider yours. • Overcome “decision reluctance” and close the sale. • Keep your investment in this customer paying off for you over and over again. 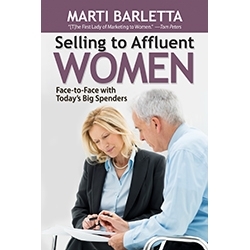 Let Marti Barletta be your go-to authority on marketing and selling to women and you will experience the same “Aha!” moments that others have already enjoyed.